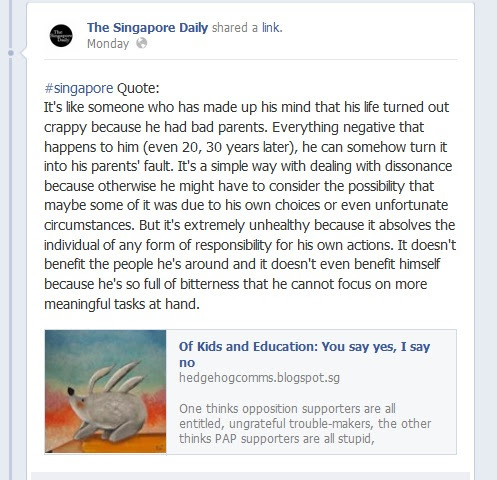 When I saw this in my facebook news feed couple of days ago and then it got me thinking. Suddenly my mind went wondering and then I started to question myself whether I am imparting enough knowledge & skills to my child to tackle the endless life challenges and the ability to survive the big "cruel" world out there? Am I doing the right thing to let him enjoy his childhood instead of stressing him to "study hard!" "must get at least 90 and above for your tests/exams"? Should I be shuttling him to tuition centre(s) after school and throughout the weekends instead of just letting him attend the art and swimming lessons which he enjoys so much? Is it right for me to let him grow and shine at his own pace and time or push him to do better and achieve a higher goal once he out do his last achievement? I know DinoBoy has potential, ok hang on, which parent in their sane mind will think their child does not have that? He is smart, he is able to grasp concept & idea fast, he is curious and he yearns for more knowledge and information each day. I am finding it difficult to keep up with him and to answer some of his queries & questions. His brain turns faster then I can turn a page, thinking of new questions to ask me or negotiate with me to allow him to use the laptop on a weekday. Some times I am appalled by the ideas that comes from him or the things he said which makes me think that I have a teenager living under my roof instead of a 7 year old. I am not a very resourceful mum, I envy some of the mummies friend who either buy or DIY worksheets or learning pack, source out loads and loads of books for their child, teaching them things way advance of their age. I wish I had done that when DinoBoy was younger or I am able to magically create some interesting ways to teach DinoBoy about Maths or Science now but I can do none of the above. So I am not like them, but I am good in other ways which I am proud of. I am focusing on building DinoBoy's character development. I taught him to be honest, compassionate, respectful, responsibility, trustworthiness, self discipline, courageous and a few other values because these are the foundations that governs his actions and thoughts in future. I introduced books to him at a young age and instilled the love of reading for besides gaining knowledge, it will also improves his analytical and critical thinking, enhance his vocabulary and writing skills, helps him to concentrate and focus, and the most wonderful thing reading can do is to open up his mind, release his imagination and make him dare to dream big dreams. However, what if I think I have done enough to help him learn the skills to navigate our world then decades later he missed the boat that could lead to something big and successful because I failed somewhere? I seriously hope that it will not happen but IF (Heaven forbid!) it does happen, I hope we have taught him well to accept the defeat gracefully and move on bravely with an open mind and heart, eager to meet the new challenges in a brand new day. I hope he will not dwell in sorrow and bitterness which can make him blind with anger thus preventing from him standing up on his own fast. I honestly don't want my child to point his fingers at me decades later and put the blame on me. 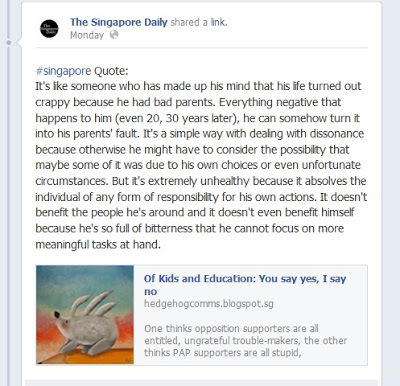 In case you are wondering, the article was nothing near parenting issues, the author of hedgehogcomms was just using it as an example to illustrate the topic he was writing. If you read that Facebook post again you will see where it says that an adult who keeps pointing fingers at his parents 20,30 years later is irresponsible. I can tell you're teaching your son responsibility and so you won't have him pointing fingers at you down the line. The important thing is to do what you know is best. They say a word is enough for the wise. Believe you're raising a wise son who will not need to hear you say every thing but can deduce from the little you're saying now what he needs to do for success. You're doing well - never ever give up and stop comparing yourself to other mums. I reckon they admire you just as much. I so appreciate that you are encouraging your child to have a childhood. It sounds like the two of you are guiding his process not programming it. Being an example for your son is as important if not more important than telling him. That is the same as a parent who makes a child wear a bike helmet then does not wear one. The child can't wait to grow up so they don't have to wear one either. It takes a lot of self control n I would say courage too to not to join in the mad race. Some times fear attacked me when some mum shares that her child can do this while mine can't or not doing as well as the average children. I hv to force myself to look the other way with a silent pray that my son will excel soon. Jen I think you are doing great! You always spend so much time with Z! That is a great thing!! I think kids that are brought up with love are very lucky. Ps how many days on the Orange Rhino hallenge? See? Adora, I feel that I did not spend enough time with him, but that's just me. And hor, I broke the Orange Rhino Challenge last month because of the haze. Cooping up in the house with him on most nights and all weekends makes me lose my cool :( So starting again and its day #12. You are doing good. Keep it up. Teach Z with your heart and the rest will just follow. Well I am an educator, so what? I am suppose to feel more stres isnt it? But I chose not to. Certain things can be taught, but certain things we need to feel and guide our children with our heart.